The New York State Agriculture and Markets Law requires that all dogs four (4) months of age or older be licensed each year. Any dog under 4 months of age running at large, must also be licensed. A certificate from a duly licensed veterinarian must be presented showing that the dog has been vaccinated against rabies. In the case of a spayed female dog or a neutered male dog, a veterinary certificate or affidavit of the procedure is required. You may either mail or bring your license application to the Pittsford Town Hall, 11 S. Main Street, Pittsford, New York 14534. 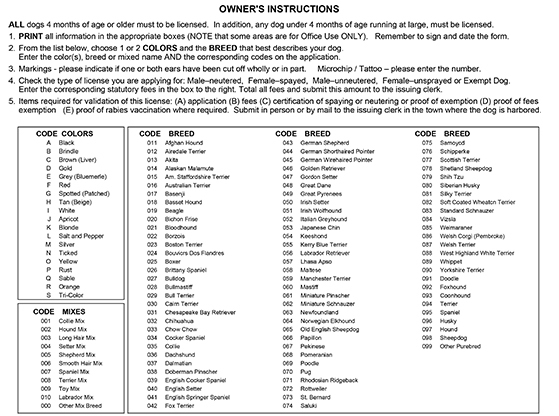 If you do license your dog by mail, please be sure to include a self-addressed, stamped envelope so we may return the appropriate forms to you. If you have any questions please call 248-6240 or e-mail the Animal Control Officer. that you will need to enter on the license application (located below the instructions). 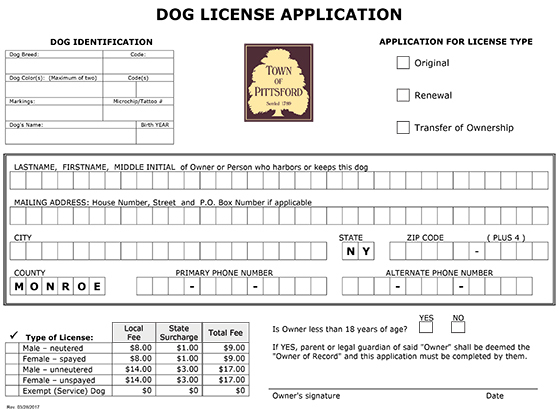 Click on the image to fill-in and print the "Dog License Application". Be sure to provide any required documentation. Please use "TAB" to move from field to field in the license application.